I don’t know about you, but I need to get in shape again after a pretty fun couple of months! 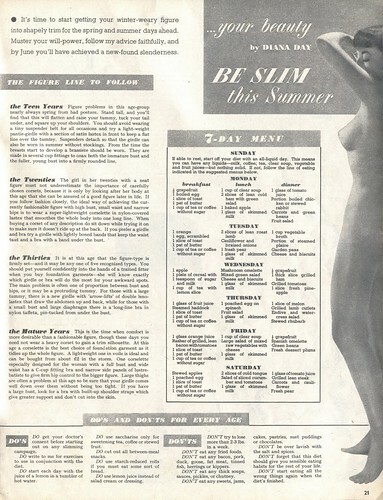 Luckily, there’s always a new idea or craze to keep you interested in your regime, whatever that may be – but I decided to go back in time for mine and follow the 1953 diet previously posted at the (AMAZING) Tuppence Ha’penny blog! What better way to get in shape than with some old-fashioned, common-sense wisdom, right? At first glance, this diet seems to be fairly balanced, but high protein, generally straying under the 1200 calorie mark. Some of the items are a little eccentric, and some of them I’ll definitely substitute (no sliced tongue, thanks! ), but generally, I hope to follow this as well as I can! I’m skipping Sunday’s all-liquid diet – I might try that at the end, but there’s no way I’m imposing that on myself during deadline week this week… Today is Tuesday, so confusingly I’ll be starting with Monday’s meals. Yes, anything to make life more complicated! 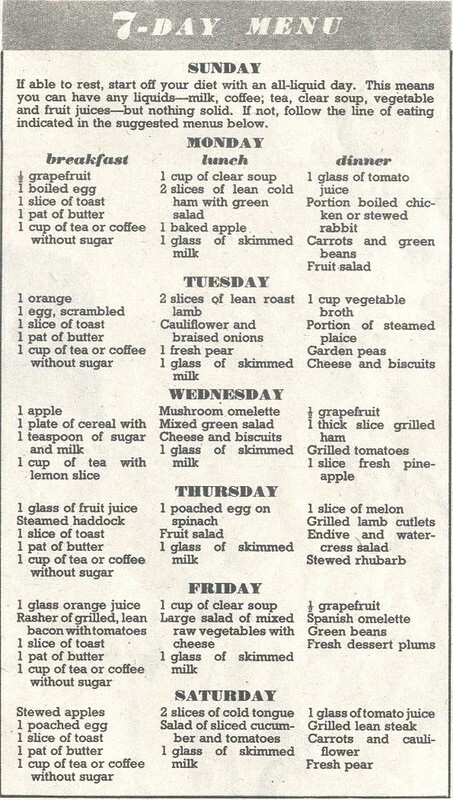 Check back later today for my run-down of Day One on the 1953 diet!